Visit Boston-Edison in person! For directions to the neighborhood, see the map page. Take a walking or driving tour of the neighborhood. HBEA puts on event year-round for residents and for non-residents. Check out our event list. One of the oldest and most successful neighborhood groups in the city of Detroit. Dues are only $40 per year, and you can join online today! We need your help! Interested in participating in events or committees? Here's how! For residents and non-residents alike! B-E in the know by reading our newsletter and receiving news and updates about events and initiatives! Subscribe online! Talk with your neighbors about what's important in the neighborhood! Join NextDoor.com (not affiliated with HBEA). Read issues of the bi-monthly HBEA newsletter, distributed throughout the neighborhood. The Boston-Edison neighborhood has been the subject of multiple press articles. Reach 1000 guests at our annual Home Tour by advertising in the Tour program. Send us an email at info@historicbostonedison.org and ask about opportunities to sponsor events. Buy great Boston-Edison swag, including tee-shirts, hoodies, mugs an more! Multiple designs are available, and all profits go to the Historic Boston-Edison Association. 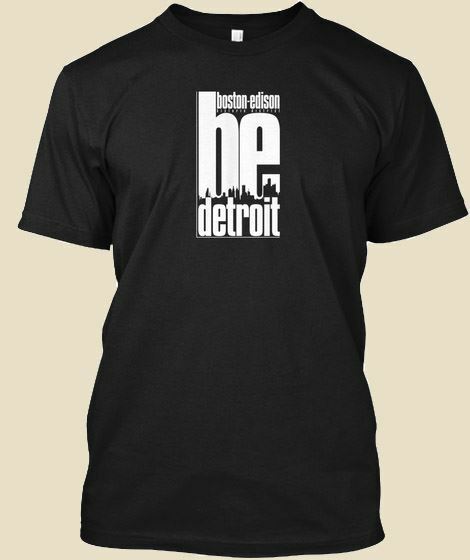 Visit the Boston-Edison store on Teespring. Interested in writing an article about the Boston-Edison historic neighborhood or the Historic Boston-Edison Association? Visit our Media Center page for fast facts about Boston-Edison. Interviews can be arranged with the HBEA president by leaving a message at the HBEA hotline (313-883-4360) or by emailing Boston-Edison at info@historicbostonedison.org.